The counter-weight Trebuchet is an evolution of the man-powered mangonel and catapults dating back before the 11th century. It has quickly spread throughout the world as an effective siege engine capable of lobbing large wall-crushing boulders. 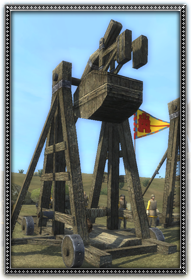 The Trebuchet is also able to fling such things as burning missiles and rotten animal remains to devastate enemy units.